The item George Washington : legacy of leadership, Paul S. Vickery represents a specific, individual, material embodiment of a distinct intellectual or artistic creation found in Evansville Vanderburgh Public Library. His name is carved in granite, his likeness cast in bronze, his legend as large as the role he played as America's first president. But before he was a commander-in-chief, George Washington was a general in a revolution that would decide the future of the people and land he called his own. If victorious, he would gain immortality. If defeated, he would find his neck in a hangman's noose. Washington knew the sting of defeat - at Brandywine, at Germantown - yet this unwavering leadership and his vision for a new and independent nation emboldened an army prepared to fight barefoot if necessary to win that independence. Wrote an officer after the Battle of Princeton: "I saw him brave all the dangers of the field and his important life hanging as it were by a single hair with a thousand deaths flying around him." Among America's pantheon of Founding Fathers, one man - to this day - stands out. 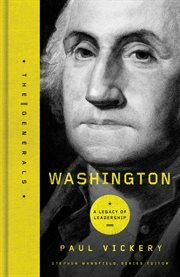 Author Paul Vickery tracks the unlikely rise of Washington, a man whose stature in command of a young army became prelude to a presidency. As Vickery writes, "He learned to become the father of our country by first being the father of our military."